When medical marijuana dispensaries and collectives first started cropping up around California in 1997, they had to heavily guard their assets – both product and cash. Banks, cowed by federal law that might ensnare them on criminal money-laundering charges, denied accounts to almost everyone who profited from cannabis, a Schedule I narcotic. Being state-legal didn’t matter. More than 20 years later, although California was late to join the recreational sales party, our Los Angles cannabis lawyers have seen so much of the legal landscape change. Profits are not only allowed, but encouraged. Collectives and co-ops were outlawed as of last month. Businesses are licensed and heavily regulated and taxed. Everything from seed-to-sale is tracked and tested by outside labs. And yet: Most Southern California marijuana businesses still can’t convince banks to do business. That means in a world where e-commerce is booming, retail stores are shuttering and most people pay with plastic, marijuana businesses can’t move money electronically. So every time cash must be moved – to pay a vendor or file taxes – it’s almost always coordinated with teams of gun-strapped security officers (many ex-military) and armored cars, equipped with bullet-proof glass and high-end GPS tracking. 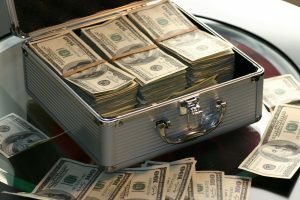 Los Angeles marijuana business asset protection lawyers know that beyond just being inconvenient and unnecessarily expensive and inefficient – physically moving cash is still very dangerous. It’s an issue many of our clients in Southern California frequently lament. They want to bank like every other business, and wish the federal law that still subjects their firms to outdated accounting methods would catch up to the 21st century. Collectively, California marijuana companies carried out some $5 billion last year in transactions. All of it was in physical cash – except at five locations, all credit unions, the only ones willing to take the risk. (Credit unions have a bit more flexibility as non-profits.) All California credit unions servicing cannabis companies are at capacity – mile-long wait lists or flat-out not accepting new clients. As The Daily Democrat learned, none of them are keen to even acknowledge those accounts publicly. It’s not just the extra security they need both inside and outside the building or anytime they move product or cash. It’s not the heavy steel bars and alarms and cameras that cover the property. It’s counting money once, twice – four times, just to be sure there hasn’t been an error that will result in significant losses. It means no official electronic confirmation receipt from an FDIC-backed institution. It means losses on interest their money might otherwise collect were it stowed in a bank, rather than stashed in a vault. The entire expanse of the supply chain and extending through taxes – all of it, cash-only. No credit or debit cards. Internal ATMS are located inside for customer convenience. Growers, producers, suppliers, distributors, laboratories, state governments, ancillary businesses, employees – almost all always paid in cash. The good news is nationally, some 375 banks and more than 100 credit unions DO accept deposits from marijuana-related companies, which is nearly triple the number who took on the risk five years ago, per the U.S. Department of Treasury’s Financial Crimes Enforcement Network. Most will only work with cannabis businesses that are physically located in the same community. They still risk money laundering charges – a big concern in the early days of the Trump presidency when U.S. Attorney General Jeff Sessions announced revocation of the “Cole Memo.” The internal policy directive put an end to the constant spate of state-legal cannabis businesses in California by announcing a halt on expending U.S. Department of Justice funds to state-compliant operations. As of this moment, it doesn’t appear to be a top priority for the administration. Los Angeles marijuana lawyers know that could change at any time unless/until Congress declares marijuana is no longer a Schedule I narcotic under federal law. In the meantime, our attorneys work diligently to ensure your assets are protected. That means helping to ensure your operation is compliant with all state and local regulations (extensive and varying by region), your accounting processes are as above-board as they can be and your employment practices comply with state and federal laws.